Our primary goal was to examine those conditions by which the effective pressure (ice pressure minus water pressure) at the ice-bed interface remains greater than zero, and thus prevents ice flotation. The likely ice thickness at Lake Superior may have ranged from 1200 to 2000m (Licciardi et al., 1998); we refer to these endpoints as 'thin-ice' and 'thick-ice' conditions, respectively. Under boundary conditions of the Last Glacial Maximum with hydrogeological properties set as for the validation model, the water-pressure head beneath the Lake Michigan Lobe ranged from 50,240 m at the northern boundary of the model to 2,292 m at the southern terminus, indicating that simulated water pressure at the ice-bed interface would have far exceeded the ice overburden pressure for any reasonable Lake Michigan Lobe thickness. By increasing the hydraulic conductivity of the glacial drift to 3.7 x 10-2ms-1, which is a value three to nine orders of magni tude greater than typical till in Illinois, the maximum simulated subglacial head is reduced to 3498 m, a value close to, but still greater than, the likely ice-overburden pressure. To test the sensitivity of the model to bedrock K, we increased the hydraulic conductivity of all bedrock units by two orders of magnitude. Subglacial head reached a maximum of 816 m at the northern upper boundary and 359 m at the ice margin. These results suggest that the subglacial aquifers could not evacuate the melt-water while maintaining subglacial water pressure at a level less than the ice-overburden pressure. Therefore, some type of drainage system may have developed at the ice-bed interface. Such a drainage system may have consisted of a meltwater film or a network of canals. Figure 11.1 Simulated flowline (dashed line). The ice limit is shown as the dark grey line and the ice cover is represented by the grey pattern. A and A' show the boundaries of the finite-difference grid. The approximate location of the Mahomet Bedrock Valley is shown where it is crossed by the simulated flowline. 1966). A 7mm film reduces maximum subglacial head to 1447m and an 8 mm film reduces head to 1099 m, suggesting that a water film with a thickness between 7 and 8 mm is sufficient to reduce subglacial head to values close to or less than the ice-flotation level for thin- and thick-ice conditions. Our simulations are based on the assumption that a water film occupies 100% of the ice-bed interface. Only a very small increase in film thickness is needed, however, to decrease the subglacial drainage area. Thus, water may have drained through some type of canal-type system that occupied less than 100% of the bed. To investigate the possible effects of permafrost near the icesheet margin, we altered the model boundary conditions by defining drift and water film cells within 50 km of the ice margin as impermeable to water. Simulations based on these conditions generate a maximum head of 1418 m, suggesting that permafrost had very little effect on subglacial water pressure. The relatively small impact of permafrost probably reflects the influence of the Mahomet bedrock-valley system on the subglacial hydrology. 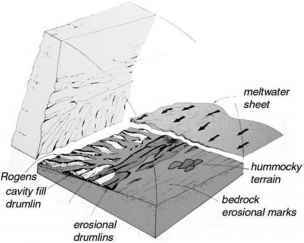 The Mahomet bedrock-valley system lies more than 50 km upstream of the lobe terminus and is thus beyond the range of our assumed extent of permafrost. Because the Mahomet bedrock-valley system is filled with thick layers of highly permeable sediment and extends far beyond the ice margin (Kempton et al., 1991), it had the capacity to divert water away from the permafrost, thus preventing subglacial water pressure from substantially increasing. When permafrost is simulated covering the Mahomet bedrock valley, the model generates subglacial heads of more than 50,000 m, further illustrating the importance of an unfrozen Mahomet valley in maintaining low subglacial water pressure. If the valley was frozen, the mechanism that could reduce the subglacial water pressure is unclear.